If you are the parent of one or more young ones, then you might know the value of in-Car entertainment, especially a system which plays movies or kids TV shows during long journeys. Such a thing saves your kids from the relentless boredom of the journey, by keeping them occupied. This is even easier now with the advent of ipads & tablets, rendering the expensive in-Car DVD players useless. However, it is a long journey and you still need to mount the tablet somewhere for comfortable viewing, for the children & adults alike. If you have put a thought into it then chances are you’ll come across many cheap plastic mounts which don’t inspire much confidence. Nextbase Universal Mounts, the next gen in-Car tablet mounts are superior alternatives for these purposes, as they are loaded with safety & convenience features. The first thing you will notice when un-boxing the Nextbase Universal Mount is how sturdy it is; a class apart from cheaper, flimsy alternatives from other companies. As claimed by Nextbase, it is the world’s first tablet mount that has been tested & fully compliant with European ECE R17 safety standards – which ensures the safety of your children & loved ones during an accident. The mount can be easily attached to the headrest using a pair of small bolts that come with the box. This is an improvement from plastic thumb screws used earlier, which are not half as solid and shake-free. After tightening the bolts the device stays firmly in place. The whole system has zero sharp edges or pointy ends, so no hurting yourself (or your child) accidentally while getting in & out of the back seat. Fitting the tablet inside the device is easy as well. Just pull the spring jaws apart and set it inside. You can secure it even further using a thumb screw right behind the jaws, there is provision for that. This makes the tablet fastened rock solid and with zero rattling while driving on the roughest of terrains. You can use the tilt function to adjust your viewing angles and comfortably enjoy your journey, hands-free. In some tablets, as in the case of my Samsung, the large jaws of the device may cover up the volume buttons. You can use the onscreen volume control without a problem though. 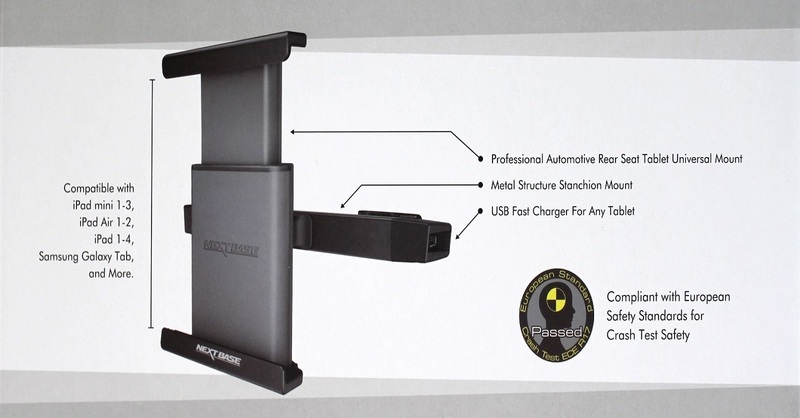 The Nextbase Universal Mount incorporates a great solution for charging as well. It comes with a long 12v power lead which is plugged into the back of the mount to power up its USB 2.0 ports. And then you could use your standard USB cable to charge the device while it is mounted in place. You could also trail the 12v lead to the 12v outlet of the car; however I recommend a hard-wire installation of the lead which is a neater and a more permanent solution. A note here though: the charging ability of the USB sockets or the 12v lead that comes with the Nextbase Universal Mount system differs from tablet to tablet, as I noticed with mine. I noticed power flow to my tablet, but not enough of it to charge it efficiently. Regardless of that, the Nextbase Universal Mount is the best in-Car tablet mount for me so far. It can take in any tablet of size, make & model which is nice indeed. It’s not a cheap one at £50, but as it is sturdier with established safety standards, it is a winner for those who seek value for money.